Meredith: How long have you been in business? 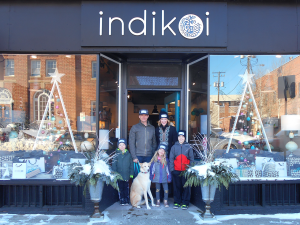 Indikoi: We have been in business for about 20 years We moved here from New Hampshire this past summer, and open our store front in November. Meredith: How did you pick Bozeman? Indikoi: We met at the University of Montana about 20 years. We moved away, and started a family, but have always had a love for Montana. Bozeman was a good fit for us because of the skiing an outdoor activities, but also the building and business growth in this area. Meredith: How did you get into pottery and art? Indikoi: (David) I took it as a blow off class my senior year, and fell in love with it. (Brandi) I have a BFA in Painting and Print Making. Meredith: Tell us a little bit about how the store front came to be. Indikoi: I really wanted to own my own retail business. I had a retail shop in New Hampshire for about 7 years, and then sold it to focus on family. David really got into the sink making about 10 years ago so we put a lot of focus into that. 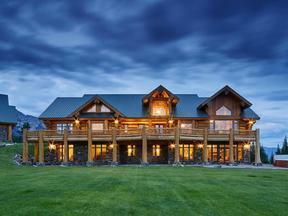 Now here we are open for business in Bozeman. Meredith: What makes your shop stand out? Indikoi: We really wanted to focus on the shopping experience. 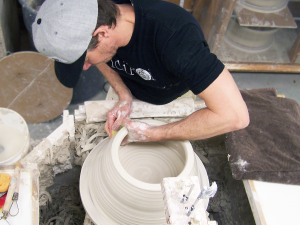 We have a visible studio where people can watch David create products right in front of them. 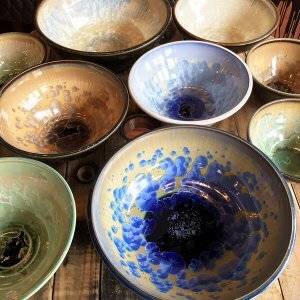 We currently carry about 40 different artists from all over, as well as a home decor line. We really want to connect and educate people about art, and the process. We also want to feel connected to our community. 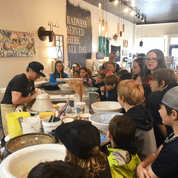 We do a community outreach, and have had several elementary classes come in for a pottery demonstration, and to learn a little bit about art. Meredith: Are your products only available in Bozeman? Hand thrown high fire porcelain Deco vessel mount sink with Ivory crystal white with pale blue glaze. Available in 8 glaze colors. 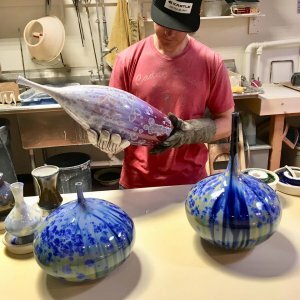 David taking some large one-of-a-kind crystalline vases out of the kiln. 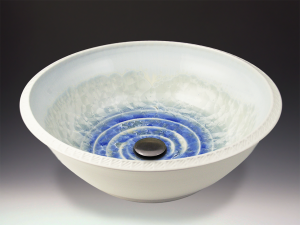 High fire porcelain crystalline glazed bowls. Available in assorted sizes and glaze colors. Community outreach and education. We are using our studio and store as a community teaching tool. We have been bringing in local schools for 1 tours, wheel demos, and talks about ceramics, the arts, and education. Our studio is set up for anyone in the community to come in, watch the process, ask questions, and learn about the arts! for one of their weekly demonstrations. This is a shop you want to see! It is warm, inviting, and full of positive energy! Not to mention I hear they play dance music all day! !